Hawaii renewable energy standards: How the state’s ambitious goals are helping it go clean. Hawaii is showing the nation how to significantly cut back on fossil fuels as a power source. 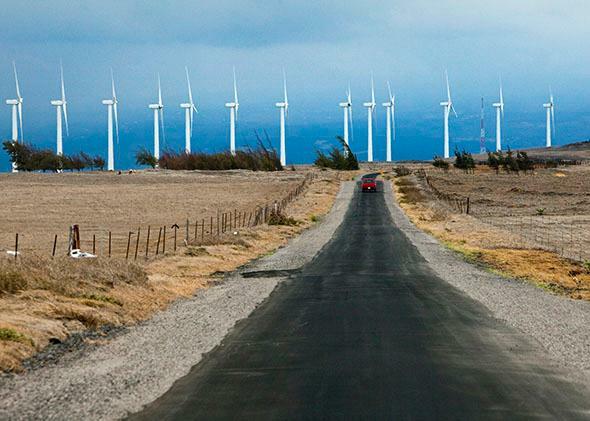 On the road to drastically reduced emissions: the Pakini Nui Wind farm on the southern tip of the island of Hawaiii, on July 11, 2010. Entities around the country are rushing to free their power supplies from carbon emissions. We’ve seen a small city in Texas do it. Companies like Google use a combination of renewable energy and carbon offsets to achieve the same result. Now an entire state wants to do the same. Earlier this month Hawaii’s legislature passed a law requiring that by 2045, all electric power consumed in the state come from renewable energy. The bill is now awaiting the signature of Gov. David Ige. Hawaii’s effort to become the first state in the union to have an emissions-free electricity supply is in large measure symbolic. The state has a population of about 1.4 million people. Honolulu’s streets and highways are clogged with gasoline-driven vehicles, and will be for the foreseeable feature. And there is reason to doubt that in 30 years Hawaii, which gets only about 20 percent of its power from renewables today, can ramp up to 100 percent. Nevertheless, we should have great certainty about the ability of any entity in America—a city, a company, a state—to substantially reduce emissions associated with electricity production, even in the absence of a carbon tax. It can start by doing what Hawaii just did: Set high standards. Time and again we’ve seen how government standards—for light bulbs, for cars, for refrigerators—have created new classes of products and markets. Now we’re seeing it happen with energy. Hawaii’s law mandates that utilities operating in the state get a set amount of power from a certain type of resource by a certain year. This is what’s known as a renewable portfolio standard, or RPS. As of 2013, 37 states and the District of Columbia had them. Accompanied by incentives, they have proved remarkably powerful tools in encouraging the growth of renewable energy. When it comes to encouraging behavior like reducing emissions, an affirmative standard works much better than a ban. An RPS effectively guarantees large amounts of emissions-free energy generation will follow. It sets up conditions under which utilities must aggressively seek out and negotiate with potential suppliers (or build their own). And it encourages players to design financial and industrial systems that make sense. In effect, the standard creates markets. And when those markets develop, they allow companies to gain scale—which pushes costs down and spurs further growth. Hawaii was given the confidence to set such an ambitious target because of the success it has had in meeting its existing RPS, which calls for a target of 15 percent of renewables by the end of 2015, 25 percent by the end of 2020, and 40 percent by the end of 2030. But Hawaii has already surpassed 20 percent, thanks to very strong growth in solar. The state’s new law will jack the target up to 30 percent by 2020, 70 percent by 2040, and 100 percent by 2045. Hawaii is in many ways a special case. Like Puerto Rico, another island where trains can’t bring coal and pipelines can’t deliver natural gas, Hawaii burns a lot of oil to make electricity. That makes electricity extremely expensive, and it makes solar a more compelling financial decision for businesses and consumers. But plenty of other states—even states that have access to cheap, coal-fired electricity—have already succeeded in surpassing their RPS targets. In Nevada, which set an 18 percent renewables target for 2014, NV Energy, the state’s largest utility, has achieved as much as 33.6 percent—nearly twice the standard. California’s RPS calls for 33 percent by 2020. The state estimates that it could already have hit nearly 25 percent in 2014. RPSes are even helping to turn red states green. In Kansas the renewable portfolio standard called for 15 percent by 2016 and 20 percent by 2020. By 2013, according to the U.S. Energy Information Administration, 19 percent of the state’s electricity alone came from wind. So naturally the extremely conservative state legislature just passed a bill to remove the requirement. And earlier this year, West Virginia became the first state to repeal its RPS. But Kansas and West Virginia are outliers. In fact, the success at meeting these standards, or at least making progress toward doing so, has spurred some states to set more ambitious ones. In recent years, when utilities have posted requests for developers to build new renewables, they have typically found that the response has been overwhelming. Thanks to the interaction of federal incentives and state requirements, the U.S. now has large, robust, and aggressive renewable energy industries. Indeed, in a move that will likely have a much greater impact than Hawaii’s efforts, Gov. Jerry Brown recently proposed pushing California’s RPS from 30 percent in 2020 to 50 percent by 2030. So can Hawaii get to 100 percent? It’s unclear. The renewable sources it has in greatest abundance—wind and solar—are intermittent. And every utility system needs what’s known as a base load—a constant, nonfluctuating, always-on minimum set of large power sources. And if you don’t have nuclear plants, which Hawaii doesn’t, you typically have to rely on natural gas, coal, or oil—that is, carbon-emitting fossil fuels. But that doesn’t make 100 percent—or something close to it—unachievable. One way to increase the relative supply of a power source on the grid is to reduce the overall demand—i.e., to work aggressively on efficiency. Hawaii could achieve a chunk of its goal simply by closing some of its oil burners, maintaining the existing level of wind and solar farms, and helping businesses and residences get smarter about efficiency. Utilities can also do a much better job of managing the energy the renewable systems produce than they currently are. Hawaiian Electric, the main utility in the state, publishes a great daily chart that traces how demand for power rises and falls over the course of the day. It shows that solar becomes a significant force during the middle of the day but dwindles as night falls. But storing a portion of the energy generated during the day and then using it at night could further cut the reliance on base power generation—even if it wouldn’t altogether eliminate it. That’s one of the reasons why storage efforts like Tesla’s new Powerwall battery have great potential for markets like Hawaii. The great thing about setting high renewable standards is that even you fall short of reaching them, you’ve still decreased your reliance on fossil fuels. Even if Hawaii fails to hit 100 percent, it still wins.